3.Pay by either sending your membership check or paying by credit card on the next screen. Please note that the business name will go directly into the Chamber website with the capitalization you specify. All capitals is equivalent to shouting on the web. Cell Phone or emergency contact no. You don't have to leave us a message but if you want to this is the place. If you need an invoice to pay us tell us here. Select programs you will be participating in. SMALL ad for businesses that sign up by June. For $100 you can add a flyer to one of our mailings to all the businesses in Tenafly ~280. You supply the flyer & we supply the stamp & envelop. Help stuffing appreciated. Check if interested. Accept Chamber Bucks ($5 each) for 100% reimbursement approximately every 2 months. We have contracted for two street fairs this year to raise money for the Chamber – April 27 & 28 and Oct 19 & 20. We expect the Street Fair to be on Washington in Spring & Piermont in the Fall. If you set up in any other location (in front of your store) we have already applied for the town permits so there is NO charge. Heavily discounted booths are available for members in the street fair. Mothers Day ad will just wish Happy Mothers Day from all members-not advertise the flower give-away. If you want to get approximately a dozen flowers for your best clients or to plant around your business, check this box. You MUST pick up at May meeting. The category you would like to win in the 201 Best Of Bergen. We will prepare a list of suggested nominees for all Tenafly merchants to distribute. Display posters from Recky's Summer Camp. We'll advertise the poster viewing locations. 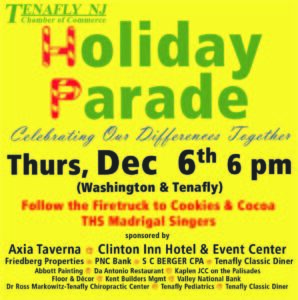 The Tenafly Chamber is pleased to honor the Clinton Inn for years of outstanding service to the Tenafly Community – hosting the Summer Concert Series during inclement weather, donating food and services to community events like the Holiday Parade and providing space for the many community service groups including the Chamber, Rotary and Northern Valley Greenway. Please let us know how many are in your party. 2017 & 2018 members are $30 prepaid, others are $40. We are pleased to have Police Chief Robert Chamberlain speaking to us on business safety issues to consider in today’s world. We will also be covering updates on the paving of Piermont Road scheduled for April 15. This is the first project for the contractor of the 2019 paving season. The contractor has up to 60 days to complete the work. The Chamber will hold it’s Spring Networking Meeting at Axia Taverna, TUESDAY June 5. 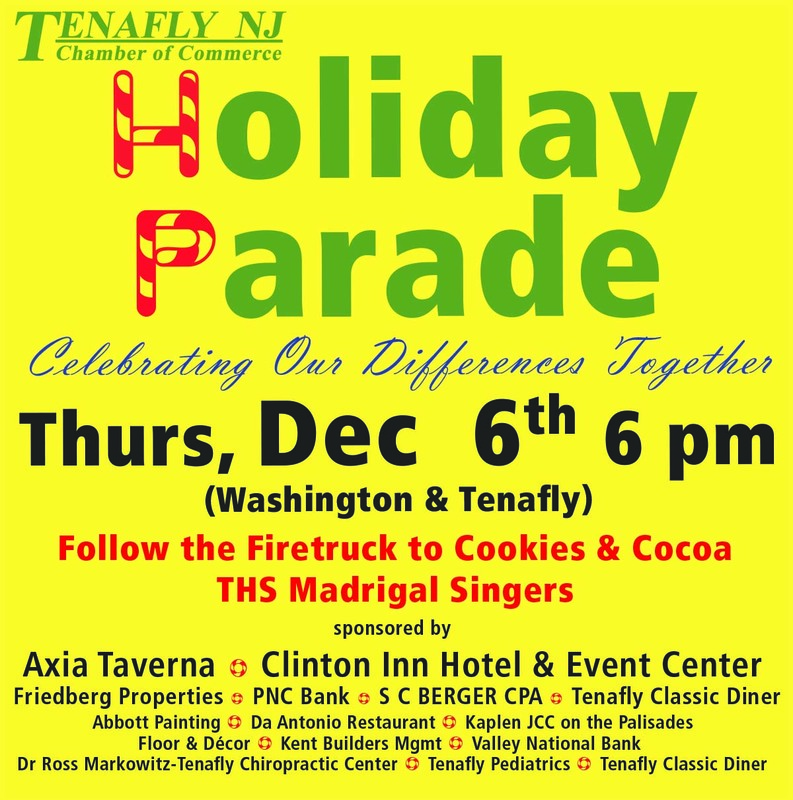 Tenafly Business Owners, all Chamber members & special guests free; other $10. Cash Bar. Don’t forget to vote early Tuesday. You know your joining? – Click HERE. You get lots of print exposure in the Northern Valley Press. You’re listed as a member in the Mother’s Day and Holiday Parade ads and you get a small ad when you join by June 1. You get a Mother’s Day giveway for your best clients – or just use the beautiful flowers to decorate your business (courtesy of Camberly Gardens). You support programs to bring traffic to Tenafly like the Dumpling Festival, Coffee Week and Chamber Bucks and Tenafly Clean Up Days (courtesy of Stacey Esser of Keller Williams). 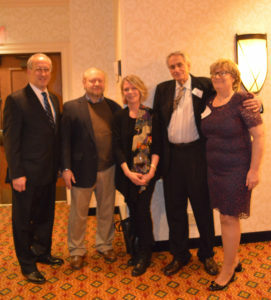 You get to support Tenafly organizations and events hassle-free – the Dumpling Festival and Coffee Week help local groups raise up to $12,500. We support the Independence Day Fireworks with free Glow-sticks for kids and the Holiday Parade with hot chocolate, cookies and give-ways. We have fun events 3 times/ year. We support new restaurants with kick-off parties a June and September and we have our elegant annual dinner in January. Questions on any programs? Give me a call – Christine Evron at 201 805-6053l. The membership packages are being mailed Friday night in late February. The Annual Dinner honoring past presidents, Bob Kutik and Jerry Magloire was a tremendous success. See pictures on our Facebook account TenaflyNJCofC.